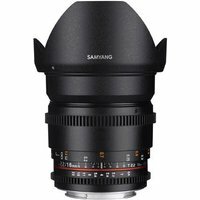 Samyang 16mm T2.2 ED AS UMC CS II VDSLR is a wide-angle, bright cine lens with geared, manual focus and aperture control rings optimised for video. The aperture ring is also stepless for smooth iris pulls, and depth-of-field markings on the side of the lens provide an essential assistance to focus pullers. This lens has a maximum aperture of T2.2 which refers to the actual light transmission of the lens and is particularly important in the film industry where light readings are normally made manually.